Making connections: the importance of live author events in keeping that spark alive and in ‘opening doors’. 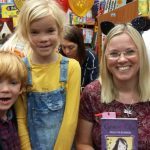 “I don’t know what to read next and I don’t think I will ever find another author who I like as much as Jacqueline Wilson’s Hetty Feather stories”. Even for adults moving on from a book or series you have loved is hard. So imagine how much harder that is for children near the beginning of their independent reading journeys. As I have chatted to parents over the following year I was surprised how many mentioned difficulties their children had in moving on from an author or series they loved to another author or book. This was both girls and boys and wasn’t just restricted to younger children. This included 10 and 11 year olds too. For some, difficulties in finding the next read, seemed to coincide with a period of ‘transition’ in their lives, where they were looking for something different to what they had read before. One important thing I have learnt is that it is not automatic that just because a child finds one author or series they love that they will find their next read. So how can we help bridge that gap? We discovered that one very effective way to do this is through live author events. In May 2016 we went to the Linton Book Festival, a bi-annual Children’s Book Festival, kindly hosted by Linton Village College, near Cambridge. We saw S F Said, Jame Mayhew and James Campbell. They were all inspiring and meeting ‘real’ authors was exciting. Their enthusiasm and that of others attending the event was infectious. This is an important point, as I think we sometimes forget how socially embedded literacy is. My daughter was fascinated to learn how authors got inspiration for their stories and how this often involved an emotional spark from something which happened in their own lives. Hearing their stories about how they got into writing inspired her to start her own diary, which she is still writing a year on. I chose S F Said’s talk because I wanted to see him, as I knew his books were interesting and I knew from following him on twitter, and friends that had heard him speak that he was an inspiring speaker. As it turned out taking my daughter along to a talk she probably would not have chosen herself turned out to be a good idea. S F Said talked about his books Varjak Paw and Phoenix. It was the later that really got her attention. She was drawn in by Dave Mckean’s wonderful illustrations. Afterwards she said it was a book she would like to read when she is older. Having a list of books to read later, seemed a new and useful idea. I also realised later, that it had opened her eyes to the science fiction genre and re-opened them to fantasy, which in turn helped to ‘open the door’ to some books she chose to read in 2017. The final event of the Festival was a family performance by James Campbell, a comedian and children’s author. He certainly knows how to put on a show which was funny for both children and their parents. So of course my daughter wanted to buy his story: Boyface and the Quantum Chromatic Disruption Machine and get it signed too! Reading Boyface she re-discovered she liked funny stories. She loved Roald Dahl stories but, she hadn’t had much success with finding other humorous stories she liked. In some the plot was in her words “confusing”, or “there wasn’t really a plot “. She had rejected David Williams, who was popular with some of her friends after she was scared by the Demon Dentist. So, discovering the story Boyface opened up a world of new possibilities of books she might like. As the year progressed I read more children’s stories for myself. I began to realise there are different sorts of ‘funny stories’ and only some contain key elements like those found in Roald Dahl’s book’s. Boyface is on the more ‘funny’ end of the spectrum, but with some quirky characteristics which make it a little bit different and I think more likely to appeal to older readers. In September 2016 we attended a book launch in Mid-Wales. At this point my daughter was experiencing a ‘dip’ in her reading. Having had an active summer, including travelling on a train to Italy, she had not done much reading in the holidays. Another factor was she again did not know what to read next. So how you might you ask did we end up going all the way to Wales for a book launch? Earlier that year I discovered the small but growing Welsh publisher Firefly Press and had been so impressed by their stories, especially the ones aimed at 7 to 10 year olds that I had decided to stock them as part of my selection of chapter books in my business Readers that Care. I had read aloud Dottie Blanket and the Hill top by Wendy Meddour to my then 5 and 7 year old. And they and I loved it. They both enjoyed the humour and my daughter loved the ‘subtle depths’, which transformed it into a thoughtful story that readers of different ages can enjoy. So we were delighted to learn about a soon to be published Firefly Press book: Grace Ella Spells for Beginners by Sharon Marie Jones. We often go away for a weekend in September where there are hills and mountains, so when we heard Grace Ella was being launched in a bookshop in Aberystwyth we decide to go and meet the author. At the launch Sharon Marie Jones read some of the story aloud, which we all loved and the kids loved getting free cake too! As a parent I found it useful to hear an author telling the story and the different voices she used for the characters, which helped me to read the story aloud to my kids when we were back home. It was a really welcoming event, which was great to be able to join. We loved reading Grace Ella together, the characterisation was spot on, my son loved that it featured a cat(he is cat crazy) my daughter loved the magic and that Grace Ella found an inventive way to deal with a girl that was bullying her. We had discovered another read aloud, which was great to read to children of different ages. My daughter enjoyed it so much she said: “Is there another Grace Ella story?” The enthusiasm we got from attending this event lasted long into the Autumn term. Something else really important happened with these events and that was that we discovered we enjoyed going to live author events as a family. There have been more since, but, I shall not mention them here. Because those first two events we attended will always have a special place in our hearts for being the events that got us started. As attending live author events as a family is something we will do as a family at least several times a year, this year, next year and every year there after. And I think it highly likely we will still be doing this when my kids are teenagers!